gardening in the boroughs of nyc: Our First Heirloom! What an exciting day in the garden. 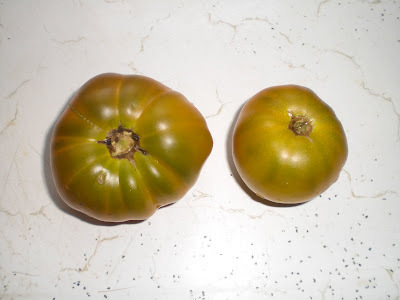 I picked our first and second heirloom tomato. I'm not sure what type of tomato it is, since we bought this heirloom rainbow blend variety pack from Burpee. In the pack contained, Bonny Best, Brandywine Pink, Golden Sunburst, Black Krim, Evergreen, and Djena Lee's Golden Girl. I'm guessing that it's the golden girl because the tomato was starting to turn a bit orange but slowly... When I sliced these tomatoes and tasted it, the flavor blew me away. It was the perfect combination of sweet and tangy. What everyone says about heirlooms is right on, totally tastes better than any tomato I've ever eaten!! When I read around the garden blogosphere about gardens that had 40, 50, 60, 70+ tomato plants, I was perplexed. However, now I finally get it! There are so many different varieties of tomatoes, and now it's my quest to try each one! Hahahahaha! I just can't wait to grow more next year! Another new addiction! Hah! It's taken me a whole week to get into tomato overload, and swear I'm going to only plant 4 next year...all determinate hybrids!!! Yay! Thems some good eatin'! I'm still waiting on the one cherry tomato plant that has a gazillion blooms but very few fruits as of yet. Patience, patience! There are so many varieties out there! I hope each year I can try a few more in the garden to see how they do. Your tomato looks good! congrats on the heirlooms. Besides the cherokee purple I have, mine have been slow this yr as well. Heirlooms are indeed the best!